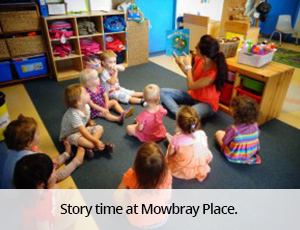 Mowbray Place Early Learning Centre is committed to providing the highest quality of care and learning for all children in partnerships with families. 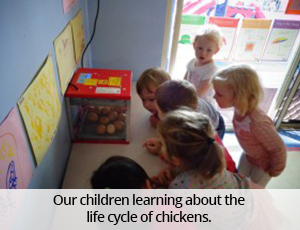 We believe positive experiences in the child’s early years lay a secure foundation for the child’s life. Together with families, the community and the child’s voice, we believe we can together develop individuals that are joyful and valuable young citizens that contribute to our community. Quality, spontaneous, open ended and teacher directed and scaffolded play experiences provide endless opportunities to practice life skills. Here the children develop creative and critical thinking, as well as representational skills as they make sense of the world and learn through investigation, exploration, manipulation, questioning and discovery. Unfolding children’s intrinsic curiosity to learn by embracing their multiple intelligence and languages, in particular emotional intelligence, social skills, communication and connection to both man made and the natural world. Our curriculum is based around a number of key concepts and focus points reflecting the National Early Years Learning Framework (EYLF) Belonging, Being and Becoming. It also envelopes play based, emerging, inclusive and child centred learning by qualified and experienced teachers, with deep rational, theory based, professional guidance. Children are encouraged to be independent learners; to self select materials and equipment and to initiate and control their own play experiences and learning. By providing a current, joyful, safe, secure, interactive, engaging and stimulating environment, children become active learners while developing independence and self esteem. Emphasis is placed on the development of agency, a sense of autonomy and worth where the children can feel included, valued, confident, safe, secure and supported as able members of their centre, family, community and the world. It is our aim to ensure our practices acknowledge the unique cultures of all people and to ensure that no one is disadvantaged while accessing our service. We strive to reflect each person and families unique culture within our day to day program, and find ways that celebrate this. Of particular note it is our practice that we find ways to interweave aspects of the Aboriginal culture and practice. We recognise similarities as well as differences and respect and value this, not just within our service but also in promoting respect for all people within our community. We believe that an inclusive environment and curriculum is better for everyone. Children learn and grow holistically where there is no segregation. This unfolds the very need for social change starting in the early years. We are committed to this complex and ongoing process by dynamic critical reflection, through a process of self-assessment. We believe this is a key responsibility of every early year professional. Being inclusive is about acknowledging and valuing our shared humanity. 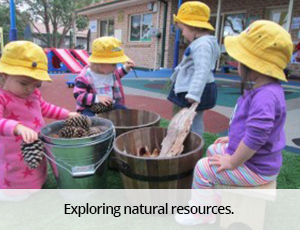 We are passionate about the natural environment and environmental education is integrated throughout the daily program. We encourage children to develop an understanding about sustainability and recycling by exploring the natural world around them and to make conscious decisions. We strongly recognise the importance of parent partnership, and encourage open, positive and trusting relationships with parents and families. Our highly qualified and experienced early childhood educators aim to achieve excellence in their role as facilitators, role models and nurturers of young children’s learning and development. We believe in the process of continually improving the education and care, through self-assessment, critical and analytical reflection and review so we can provide the highest quality service for our community.